All doors on Silver Line buses will open for boarding, and fares will be waived to speed airport-to-downtown transfers. Passengers taking Silver Line buses from Logan Airport will ride for free starting Wednesday, a move that also means free transfers to the subway system at South Station and appears to make Logan the first major airport to provide free public transportation for travelers heading downtown. Massport will underwrite the roughly $100,000 a month needed to subsidize the 90-day pilot project, part of an effort to promote public transportation that includes the recent installation of countdown clocks to demystify Silver Line arrivals. Earlier this year, Massport raised rates for airport garages while cutting fees for parking at suburban lots and Logan Express bus rides. This summer, it will improve signs and hire students to promote public transportation and help travelers navigate the options. Neither the American Public Transportation Association nor Airports Council International knew of another US airport that provides free transit for air travelers heading to a downtown, spokeswomen for the organizations, which represent transit agencies and airport operators, said Monday. In 2011, Logan handled nearly 29 million passengers and is on pace to eclipse that in 2012, setting another record. But parking is constrained by Logan’s limited footprint and by federal and state environmental laws that cap the number of airport parking spaces in East Boston. Massport’s plan to attract as many as 37.5 million travelers annually hinges on its ability to promote public transportation and other alternatives to driving. 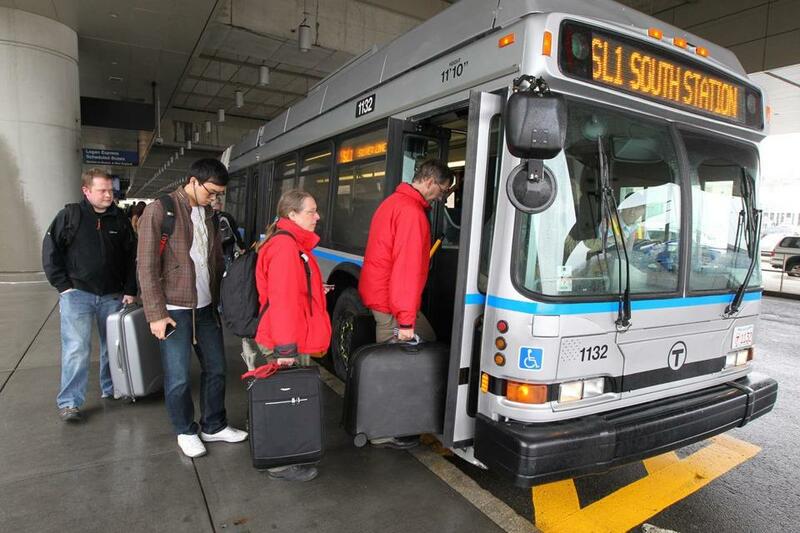 A 2010 survey found that 70 percent of travelers to Logan arrived in their own cars, drove rental cars, or were dropped off by car or taxi, with the rest coming by bus, van, subway, ferry, charter, or courtesy shuttle, according to Massport, which wants to shave the percentage to 65. Logan remains one of the top five daily destinations in Massachusetts for single-occupancy cars, Secretary of Transportation Richard A. Davey said. The others are shopping malls. For environmental and economic reasons, the state wants more travelers to take public transportation to Logan, Davey said. Logan already promotes its proximity to downtown Boston as a selling point, with a considerably faster trip to the city center than from airports in New York, Chicago, San Francisco, and other cities. Travelers awaiting the Silver Line on Monday welcomed word of the free rides, not just as a money-saver but for their potential to speed boarding. Silver Line buses are often held up while travelers try to figure out payment or even which door to enter. “I’m a fan of anything that makes it faster,’’ said Gabe Erion, a Harvard University sophomore from South Dakota. He said classmates call the bus the “Silver Lie’’ because of delays at the airport and what feels like a plodding trip through South Boston’s Seaport District between Logan and South Station. Riding the Silver Line while on the way to catching a flight can be harrowing, with travelers checking and rechecking watches as first-timers hold up the bus at the front-door fare gate or by trying to enter at the middle or rear doors, which are supposed to be used only for disembarking. In the pilot program, all doors will be open for boarding. The Silver Line debuted between South Station, the Seaport, and Logan seven years ago. It takes 15 minutes or less, depending on the time of day, to go from South Station to Terminal A and from Terminal E again to South Station - and nearly as long in between terminals. In its first months, it attracted roughly 1,000 departing travelers a day at Logan, a figure that has tripled, though Silver Line ridership is equal only to about half of Blue Line subway ridership from Airport Station, which requires a free connecting bus to reach the terminals. Familiarity with that free shuttle is one more reason some are surprised by the request to pay when boarding the Silver Line. In considering whether to extend the pilot beyond August, officials will evaluate its effect on the Silver Line’s popularity and speed between the terminals. Erik Beck, a financial adviser from Atlanta, was among the travelers on Monday forgoing taxis and rental car shuttles for the Silver Line. An occasional visitor, he needed a refresher at the T vending machine. Then he saw the display, installed in January, that told him just that. “Pretty neat,’’ Beck said, joining a cluster of travelers who would line up for one more halting boarding.